Synopsis: While serving a five-year sentence for a violent crime, a 12-year-old boy sues his parents for neglect. Review: It happens every year around this time. We’re neck deep in awards season and the foreign language film categories start to loom large for me. The movies submitted for consideration by their countries that make the Oscar shortlist and nab spots on the earlier awards ballots (the Golden Globes, the BAFTAs, etc) start to become clearer and you can predict which will probably be the nominees at the Oscars. Yet these are the films that will inevitably be my Achilles Heel, either because I often lack the drive to see them or miss the opportunity to screen them when they present themselves. Then I have the opportunity to see a movie like Capernaum and I realize that I’m my own worst enemy and I need to see more foreign films not just during Oscar season but throughout the year. The likely nominee hails from Lebanon and is from celebrated director Nadine Labaki, who also has a small supporting role as the defense attorney for Zain (Zain Al Rafeea) a young boy appearing in court bringing charges against his parents. In flashbacks, we see why he’s brought his parents to a very public hearing before a judge and what kind of life he’s been forced to live in the short twelve years he’s been alive. Before you think this is just a Lebanese remake of Irreconcilable Differences, know that Zain’s story is filled with trauma and poverty the likes most of us will never know and, like many privileged US citizens that will watch the movie, the film was an eye-opening experience for me. Zain’s journey takes him from his family apartment in Beirut to a rundown amusement park where he is befriended by Rahil (Yordanos Shiferaw), an Ethiopian woman in the country illegally forced to hide her baby, Yonas, who is also undocumented. Forming a sort of fractured family with the woman and her child, Zain takes on responsibilities in caring for the baby while Rahil works on getting her papers in order. Through several devastating twists, Zain and Yonas are left to fend for themselves and eventually we’ll find out how Zain ends up in jail serving time for a violent crime. This is a tough film to watch and I’m guessing an even more difficult film to get made. Labaki was working with actors that had no experience in situations that were culled from real life stories. That she was able to coax such realistic performances out of them is nothing short of remarkable, lead by a mesmerizing performance by Al Rafeea as our young hero. Wise beyond his years and forced to grow up faster than any child should, his tiny frame bears evidence of neglect and yet he always soldiers on. Shiferaw, too, impresses as a mother left to fend for herself by the man who got her pregnant and now offers no support. With little options, she desperately attempts to piece together a semblance of a better life. Though it runs slightly longer than necessary (it hammers its points home loud and clear) there are unexpected surprises throughout. Let it be known that Boluwatife Treasure Bankole, the infant that plays Yonas, is the cutest baby you’ll see on screen in 2019. Labaki is good at turning her camera on faces and places we don’t normally see. The overwhelming bustle of the city is captured thoroughly, you can easily see why two children roaming the street could be overlooked by passersby. True, there are several brutal lines of dialogue that cut like a knife but Labaki ends the film with an extended freeze frame that’s downright beautiful. 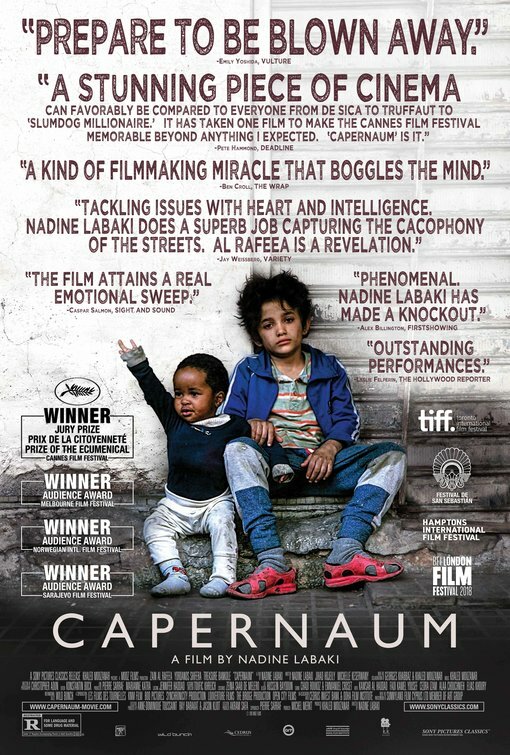 Even if you’ve heard that Roma has it in the bag for the Academy Award this year, keep your eye on Capernaum as a stellar example of the power of world cinema.